FOB(Shanghai) or CIF (assigned port). This machine allows for the tension stringing of twin-bundle conductor of 500mm2 and below in mountainous and hilly areas, of twin-bundle conductor of 630mm2 and below in flat lands, and of single conductor 720mm2 in various terrains; besides, it can be used for traction stringing of OPGW or ADSS optical cable and 220kV haulage rope in various terrains. Closed hydraulic circuit for step less speed variation in both rotating directions. 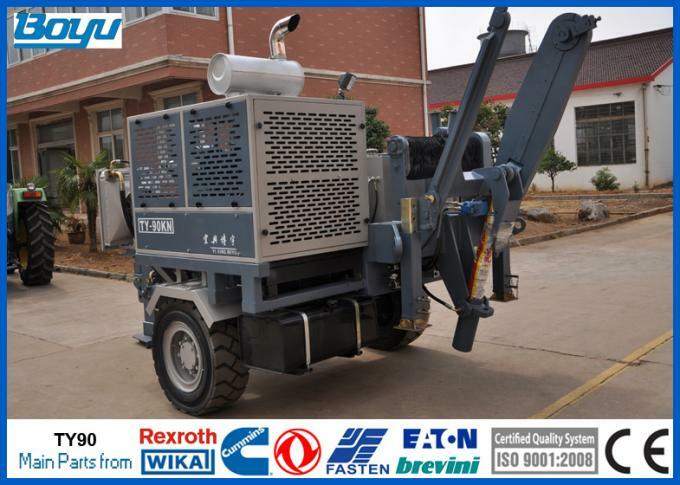 This machine is provided with a pull pro-setting system that maintains the pre-set pulling value (also when the speed is reduced to "0") by automatically adjusting the operation speed according to the friction and unexpected loads which may occur. 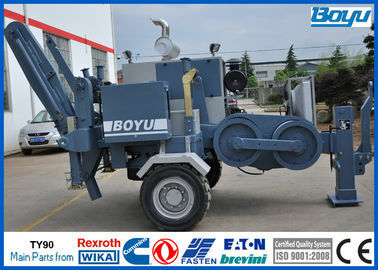 Established in 1997, Yixing Boyu Electric Power Machinery Co., Ltd. is a manufacturer specialized in the research, development and production of Electric Power Machinery. We are located in beautiful and rich city: Yixing city. We are a High-tech enterprise in Jiangsu Province, with convenient transportation access. All of our products comply with international quality standards and are greatly appreciated in a variety of different markets throughout the world. 2. Our company was founded in 1997, having 15 years rich experience in this field. Our product sells in distant markets: Sudan, Kenya, Angola, Pakistan, Burma, India, Mexico, Germany etc. Our product is also very popular in china. 3. We have one year quality guarantee, if internal components go wrong within one year, we will change another for free. 4. We can supply the specific components to the buyers with cost price after warranty period. In 2010 achieved the national ministry of science and technology innovation in science and technology project. To November, 2013, Boyu enterprise has already sell puller and tension equipment (excluding mobile ground grinding) nearly 5000 sets. Our products are sold well in Australia, Egypt, England, Sudan, Kenya, Angola, Pakistan, Burma, India, Mexico, Algeria, Turkey, Peru, Colombia, Brazil, Argentina etc.